Mike Ullery | Daily Call City of Piqua employee Tyler Lee rinses off the city’s brine truck after a day of pre-treating streets for this weekend’s predicted snow and ice storm. City street crews are standing by to work 12-hour shifts, when called, to keep streets clear once given notice to begin. City of Piqua employee Tyler Lee rinses off the city’s brine truck after a day of pre-treating streets for this weekend’s predicted snow and ice storm. City street crews are standing by to work 12-hour shifts, when called, to keep streets clear once given notice to begin. 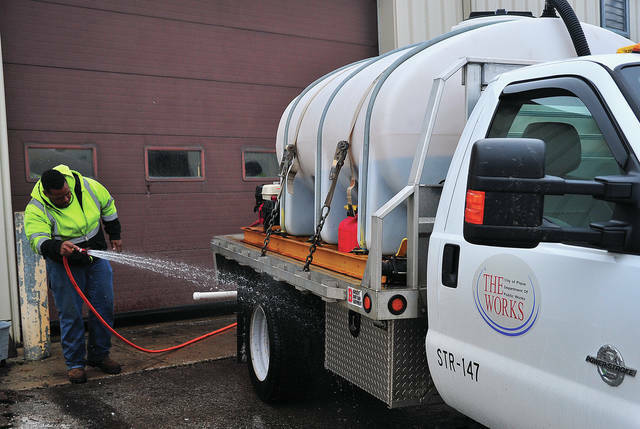 https://www.dailycall.com/wp-content/uploads/sites/30/2019/01/web1_011819mju_piqua_weatherprep.jpgMike Ullery | Daily Call City of Piqua employee Tyler Lee rinses off the city’s brine truck after a day of pre-treating streets for this weekend’s predicted snow and ice storm. City street crews are standing by to work 12-hour shifts, when called, to keep streets clear once given notice to begin.